The sound of a leaky faucet can be annoying. Beyond that, each drip is a waste: of water and of money. To clarify, a leak can cost up to $200 a year, depending on how fast the water drips out. Even a slow drip that costs $20 a year can send seven to 10 gallons of water down the drain every 24 hours. That’s water you could be drinking or using to cook or wash! The best plumbers will not only be there for you in emergencies, but will also help you in other ways. Ideally, you will get help with saving money and water all year long. One of the best ways to do this is by fixing any leaky faucets you may have. Some leaks are easy to identify. For instance, you may see water dripping from the kitchen faucet—a no-brainer, right? You may also hear that telltale drip drip drip at night, when the house is quiet. Not all leaks are so obvious, however. Some are very slow, but still present. Every so often, fold a paper or cloth towel and leave it directly beneath a shut-off faucet for several hours. For example, overnight is a good idea. When you check it later, you will be able to feel whether it is still dry or it has become damp. A moist towel is a good indicator that the faucet above is leaking. In short, just about any fixture that delivers water can potentially develop a leak. When checking, consider sink faucets in the kitchen or bathroom, bathtub faucets and shower heads, and even outdoor hose spigots. Aside from the monetary and environmental cost of a leak, dripping faucets can also cause other problems. Long-term leaks can discolor the sink, especially in areas where the water has a high mineral content. Leaks can also cause caulk and grout to deteriorate more quickly than it would otherwise, which can lead to bigger headaches. 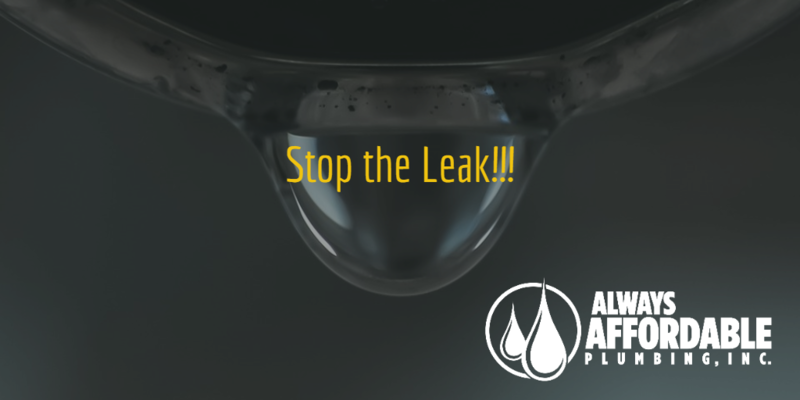 An ongoing leak may create small pools of water under certain conditions. Consequently, these pools can then find places to flow and cause serious damage. For example, even a tiny trickle that finds its way below the sink can lead to plaster or floor problems. There are many reasons a faucet may develop a steady drip. Fixing it can be as simple as tightening a loose nut or replacing a worn-out washer. In some cases, however, the solution could require total faucet replacement. Not sure whether you’ve got a simple drip or bigger problem brewing? Contact Always Affordable Plumbing for a FREE inspection, which can include potentially leaky faucets, as well as other common plumbing problems around the house.